I just folded a pile of laundry that felt like digging a tunnel to China from my own backyard (if I had one). Like, that load of laundry was NEVER-ENDING. You know how sometimes the laundry pile is all, Oh, it looks like a lot but really it’s all sheets and towels and there’s only about five things to fold? This was not that laundry pile. This was literally. Every. Single. Item. Of. Clothing. In. Our. Household. One Peanuts holiday special ended and another began and my husband got home (at last) from super late night at the office and I was STILL folding laundry. And drinking wine, because, my God, the laundry. LittleMan’s SOCCER SOCKS were in the laundry, though soccer season ended a month ago. Because we went ice skating over the Thanksgiving holiday (while I was avoiding laundry, clearly), and ice skating, as you probably know, is akin to soccer. In that it is a sport requiring specialized footwear. I’d like to say this about the ice skating: YAY! The holiday ice rink at Justin Herman Plaza has been there forever (or minimally, since the early ’90s; I used to skate on the ice rink in high school). It follows that every year that we have lived in our apartment, we have watched the holiday ice rink get built, starting sometime before Halloween, plank by plank and tube by tube. Years ago, with my babies in strollers , we would adventure out in the mornings and chart its progress, this first harbinger of the Christmification of the Embarcadero. For seven years we have watched the skaters spin and heard the faint echoes of the ’80s dance music extravaganza from our deck on the 15th floor nearby. All this time, the holiday ice rink has been an integral part of getting into the festive spirit, and yet…and yet…we have never actually attempted to take the children for a spin. Maybe I’ve mentioned once or twice that LittleMan likes to try things on his own terms. He loves to bike. Specifically in the summer time, while camping or in Tahoe. He does not like kickball, which makes him feel left out at recess, because his best friend only wants to play kickball (and then the best friend thinks LittleMan doesn’t want to play with him, and feelings are hurt, and round and round we go…KIDS, sigh). He loves to swim pretty much anytime and he loves to Lego all the time and he loves to read and play ninjas, but he has made it clear over the years that physical challenges (and particularly physical challenges which might result in being cold or wet or getting blisters on ones’ ankles) are best arrived at in their own time. Imagine my glee and trepidation, then, when Littleman decided that this was his year to hit the ice. Just him and me to start: ice skating and lunch, a little holiday date. How would this go? I’ll save you the agony: it went well. So well, in fact, that a couple weeks later we went en famille and guess what: that went well too! 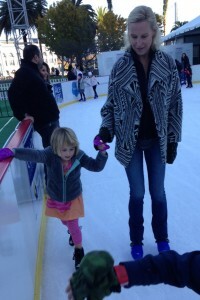 Cruising awkwardly around the crowded rink, trying not to let Babygirl’s flailing legs take me down, Wham on the loudspeakers and LittleMan ignoring all rules of ice rink traffic as he shuffled back and forth between my husband and me…it was honestly one of those moments that holiday magic is made of. In the photos my husband managed to snap I am grinning. We are all smiling, in fact. We are having fun as a family. We lasted about 27 minutes. Babygirl fell and LittleMan’s feet hurt and we whisked off the ice for some congratulatory hot chocolate. Because the first rule of parenting is to quit while you’re ahead. 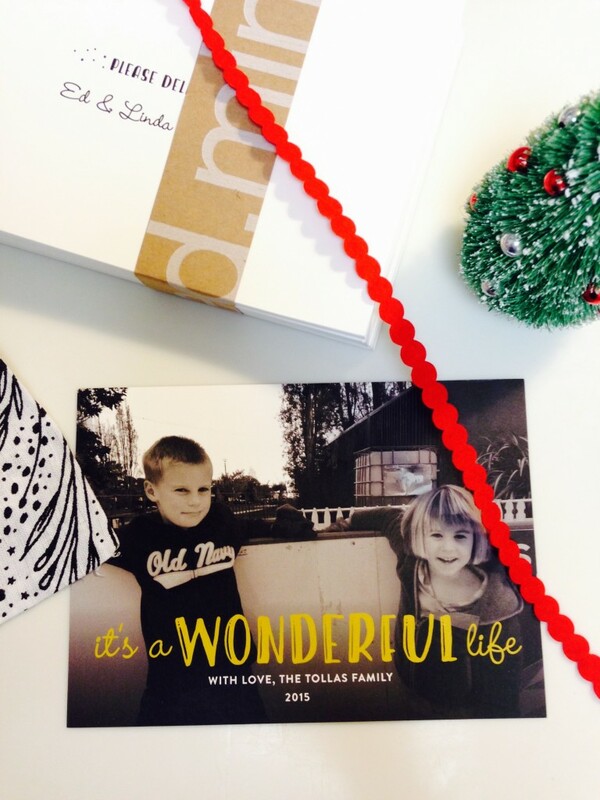 Since I ordered my Christmas cards from Minted this year, a number of people have asked me where that photo was taken. What is the little cabin in the background? Are the kids wearing gloves? The photo was taken — in the nick of time! 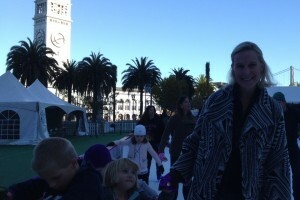 — at the Holiday Ice Rink at the Embarcadero, where two children who are notoriously impossible to photograph had so much fun that they actually managed to look at the camera and smile, at the same time. It’s a messy life. Challenging and imperfect, beautiful and bursting at the seams with so much love and happy chaos that there is really no other way to say it. To be alive, to clock another year of living this wild ride, this full range of human emotion with my little tribe: it’s a gift. It’s wonderful. Merry Christmas and Happy New Year to my readers. 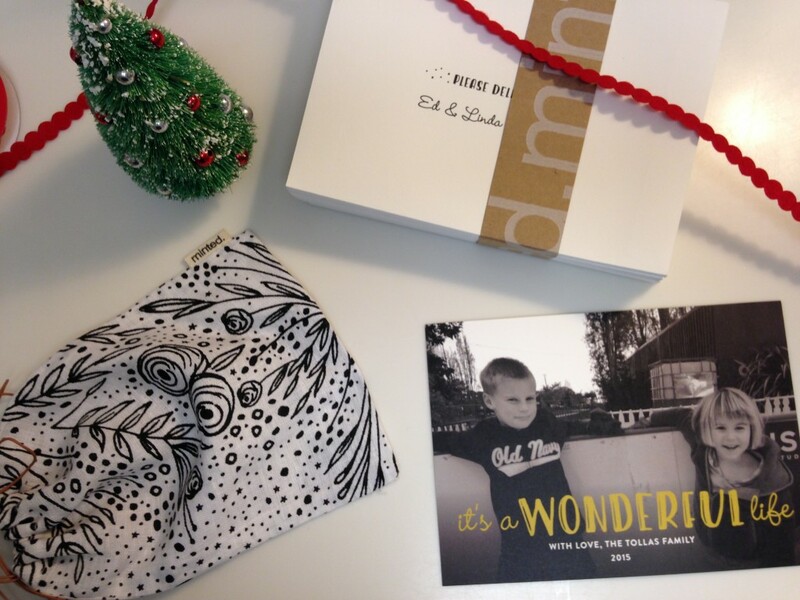 Thanks to Minted for partnering on this post. Minted is currently offering free, expedited shipping on New Year’s cards for anyone still wanting to capture an 11th-hour memory.